The story goes that this was first served in an inn run by two maiden women in France. 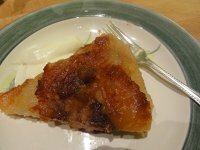 One of them dropped a traditional French apple tart on the floor, scooped it back onto the platter, sprinkled it with sugar and butter and ran it under the broiler before bringing it out into the dining room again. Thus, the first caramelized upsidedown French apple tart or Tart Tatin, named after the Tatin sisters. To make the pastry, place the flour, sugar, and salt in a bowl. Cut in the butter with two knives or a pastry cutter. When the mixture resembles breadcrumbs, make a well in the center and pour in a mixture of the water and egg yolk. Bring the mixture into a ball with the fingers of one hand and then knead briefly. Chill the dough wrapped in wax paper. Meanwhile prepare the apples. Butter the bottom of a heavy bottomed 9 or 10 inch pan with 4 Tbs. of the butter. Sprinkle with 1/2 cup sugar. Pack the apples into the bottom of the skillet. Sprinkle on the another 1/2 cup sugar and dot with the remaining 4 Tbs. butter. Cover and cook over high heat for 5 minutes, until the sugar has melted. Remove cover and cook over moderate heat for 15 minutes or so, until the sugar has caramelized and is pale brown color. When the apples mixture is ready, roll out the dough and place it over the apples. Tuck in the edges all around. Bake the upsidedown tart in a preheated 350 degree oven for about 30 minutes. When the pastry is cooked, remove the tart from the oven and turn over onto a serving plate. Some of the apples may stick to the pan. Just scrape them off and rearrange them on the tart. If the tart is not dark enough, sprinkle with additional sugar and run under the broiler. Lightly whip the cream and stir in a sprinkling of sugar and a splash of vanilla. Serve the tart in wedges, with a dollop of sweetened cream on the side.